Every FPGA has a set number of programmable logic, routing, I/O, and memory resources. LabVIEW uses these resources to implement code on the FPGA. The programmable resources on an FPGA repeat at regular intervals, which allows for short paths between the resources. Short paths between resources reduce the minimum execution time required by code running on the FPGA target. The repeating resources on an FPGA also allow multiple concurrent processes to run on the same device at the same time, while minimizing resource conflicts. The following illustration shows a simplified example of programmable resources on an FPGA. Configurable logic blocks (CLBs)—Basic repeating units of logic on the FPGA. 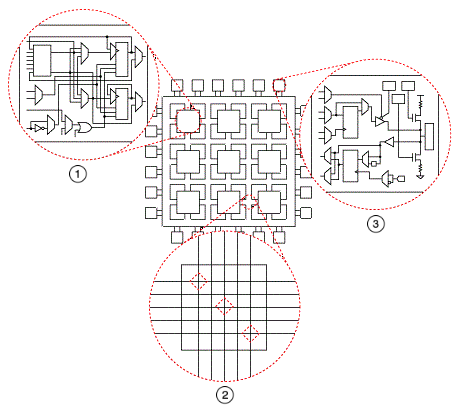 Programmable routing—Interconnecting wires that join CLBs together to build complex logic. Programmable routing also joins I/O blocks to CLBs, and joins CLBs to memory resources. I/O resources—Analog and digital inputs and outputs that connect the FPGA to external signals. Receives inputs from the I/O blocks. Processes the inputs using CLBs. Passes the processed inputs back to the I/O blocks as outputs. The compiler uses different combinations of available FPGA resources to implement the same LabVIEW code depending on the performance directives you set and the resources available on your FPGA.